We interest to environmental factors preceding protein aggregation in neuronal system ,and we focused on prion protein(PrPc) and amyloid-beta proteins(Abs) . Our study involve the mechanisms of protein aggregation with pH shifts, temperature and metal ions surrounding PrPc and Abs from monomer to precede oligomers, and a new diagnostic approach to identify the monomer and oligomers in patients’ serum. In these process, we found a specific 8-residue peptide and a chemical compound to break protein aggregation and studying a clinical application for prion disease and Alzheimer’s disease. Environmental factors of protein aggregation- PrPc and Abs. Identification of responsible amino acids residues of protein aggregation. Structural baisis of PrPc and Abs. Diagnostics of Alzheimer’s disease using patients serum. Breaker peptides of abnormal aggregation of PrPc and Abs . Chemical compounds to inhibit abnormal aggregations of PrPc and Abs. Identification of ApoE processing protease in human monocytes. Our experiments involve a range of methods – protein chemistry, molecular biology, immunology, enzymology and cell culture. The results of this work are of both theoretical and medical interest. Suenaga M, Hiramoto Y and Matsunaga Y, Vitamin D2 interacts with human PrPc (90–231)　and breaks PrPc oligomerization in vitro. Prion. 7(4), 1-7 (2013). Yamamoto H, Oda M, Nakano M, Yabiku K, Shibutani M, Nakanishi T, Suenaga M, Inoue M, Imagawa H, Nagahama M, Matsunaga Y, Himeno S, Setsu K, Sakurai J, Nishizawa M., Concise synthesis of a probe molecule enabling analysis and imaging of vizantin. Chem Pharm Bull, 61(4):452-9 (2013). Inubushi T, Kamemura N, Oda M, Sakurai J, Nakaya Y, Harada N, Suenaga M, Matsunaga Y, Ishidoh K, Katunuma N. L-tryptophan suppresses rise in blood glucose and preserves insulin secretion in type-2 diabetes mellitus rats.J Nutr Sci Vitaminol, 58(6):415-422 (2012). Saito Y, Takashima Y, Kamada A, Suzuki Y, Suenaga M, OkamotoY, Matsunaga Y, Hanai R, Kawahara T, Gong X, Tori M, Kuroda C. Chemical and genetic diversity of Ligularia virgaurea collected in northern Sichuan and adjacent areas of China Isolation of 13 new compounds, Tetrahedron. 68:10011-10029 (2012). 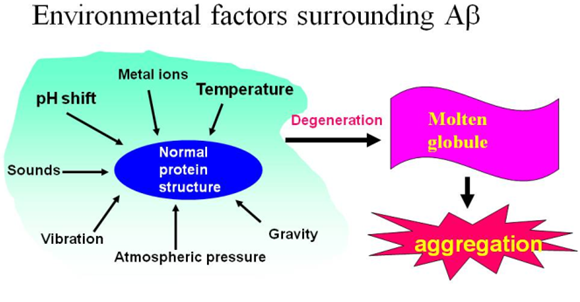 Yoichi Matsunaga and Midori Suenaga; Environmental factors preceding Ab 40 monomer to oligomers and the detection of oligomers in Alzheimer’s disease patient serum- Review, J. Amino Acids , 1-8 (2012). Hatip F, Hatip I., Matsunaga Y., Suenaga M. Sen N; Effects of 8-residue beta sheet breaker peptides on aged Ab40-induced memory impairment and Ab40 expression in rat brain and serum following intraamygdaloid injection. Curr Alz Dis, 7, 602-624 (2010). Hatip F., Suenaga M., Yamada T., Matsunaga Y; Reversal of temperature-induced conformational changes in the amyloid-beta peptide, Ab40, by the b-sheet breaker peptides 16-23 and 17-24. Br J Pharmacol, 158, 1165-1172 (2009). Hatip F, Matsunaga Y, Yamada T; Specific reactivity of mild/severe Alzheimer’s disease patient’s sera to antibody against Abeta 1-40 epitope 17-21. Acta Neurol Scand, 117,404-408 (2008).